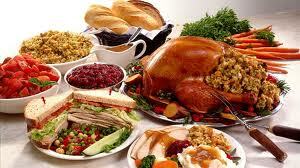 I read recently that the average Thanksgiving dinner contains an estimated 4500 calories. And that’s just the meal proper. That doesn’t include all the junk you eat before everyone gathers at the table or the turkey sandwich you eat after the family has packed up and headed home. That’s enough calories for two to three days! With that in mind, I’d like to describe what I believe to be the best exercise anyone can do to prevent holiday weight gain. It’s a really simple exercise, but one that many have trouble performing. There’s very little equipment required. In fact, you’ll put down any equipment that you’re holding on to immediately prior to performing the exercise. Position yourself approximately 8 inches from the edge of a table. Place your hands, palms facing away from you, at the edge of the table. Forcefully push against the table to slide your chair away from the table. Walk away from the table. I call that exercise “The Pushback”. It’s that simple. Now, don’t get me wrong. I’m not advising that you skip your traditional Thanksgiving dinner. Enjoy your family and a nice meal, but do so in moderation. Here are a few ideas to help you manage your holiday calories. Drink water with your dinner. In fact, drink a big glass of water before dinner and you’ll eat less. Eat more turkey and less of the other stuff. Your body has to work harder to digest the protein and it makes you feel fuller faster. Go for the salad first. The fiber will fill you up faster, leaving you less likely to eat the calorie-dense foods. Go light on the gravy. Many of the calories and fat are found in the gravy and sauces. Chew your food. The longer you take to eat one helping, the less likely you are to go back for a second (or third). Previous PostPrevious Are you powering a Hummer with a weedwacker?